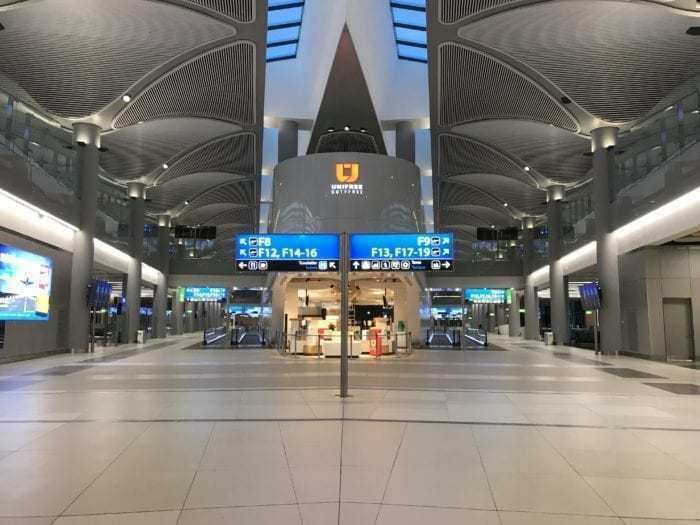 Flying Through Istanbul’s Superhub Airport – What Is It Like? Turkey’s history and destiny hinge on its unique geography. Neatly sandwiched between East and West, its identity during the last century was forged through its independence, with its natural Easternness being melded with Western secularism. Fast forward exactly 100 years since Kemal Ataturk demanded national liberation for Turks in their own state, and the existing airport named for him, in the south-west of Istanbul is long past its sell by date. 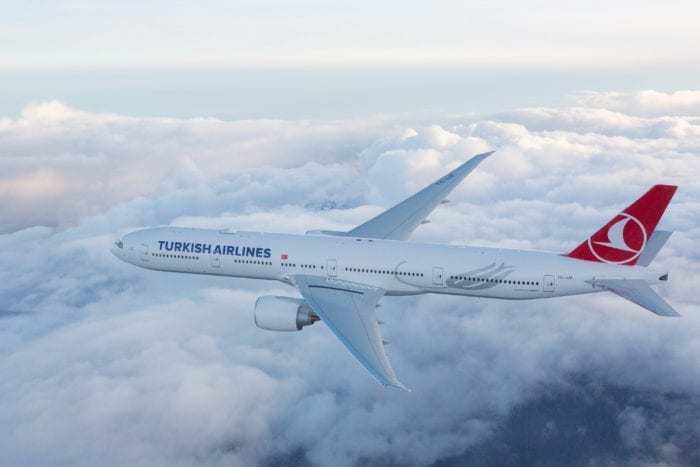 Turkey is resurgent and belligerent, and its superb national airline, Turkish Airlines, is a flying ambassador for Turkish culture and identity worldwide. Istanbul sits at a crossroads; the perfect site for a modern intercontinental hub. 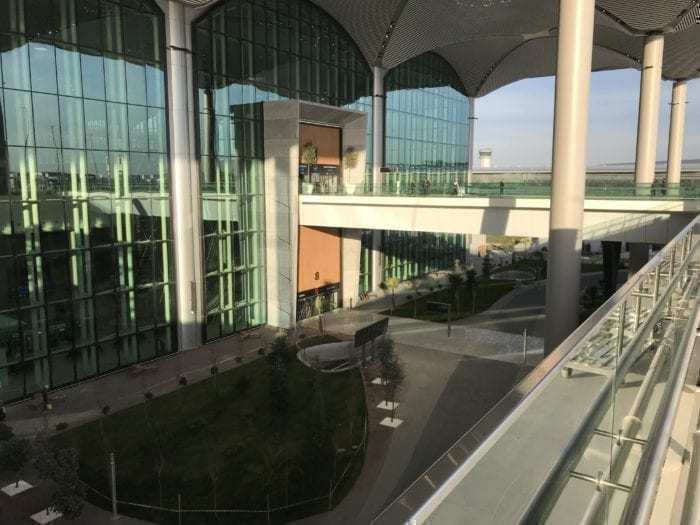 Enter Istanbul New Airport (or, more simply Istanbul Airport – ISL – to differentiate it from Ataturk). 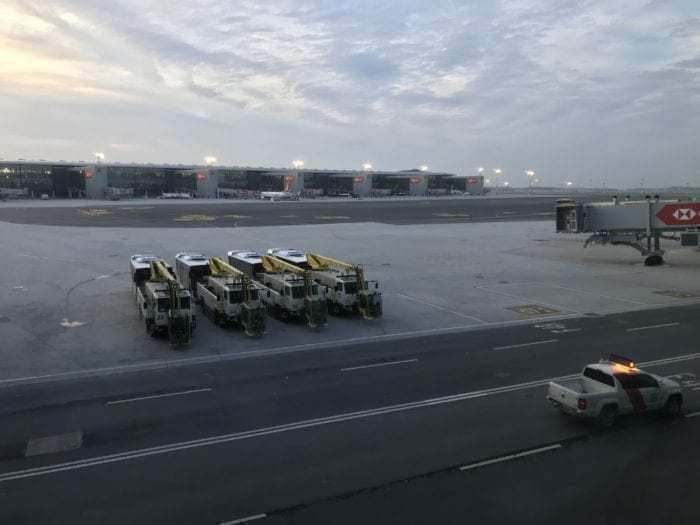 A potential global superhub designed to serve 90 million passengers a year, this enormous airfield partially opened last October serving just 19 routes. 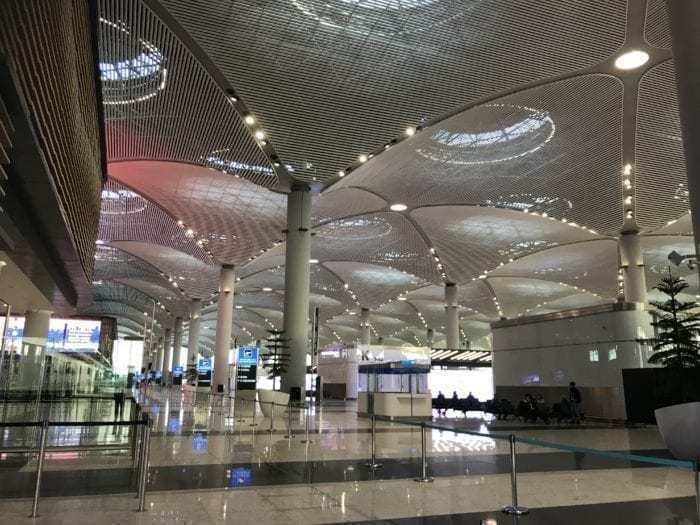 I was long overdue a visit, and booked a flight to Baku, Azerbaijan to check out the new airport for myself and make a video for my YouTube channel. The airport lies some 35 kilometres from Istanbul, and I advise anyone using the airport in its interim phase to exercise caution. I arranged my own shuttle via my hotel for around 30 Euros, but they weren’t even aware the new airport was open, and had to check! It will take around an hour to get there by road from central Istanbul. Metro service will not link the airport to the city for another year. Upon arriving, I was struck by the size of the terminal. It was vast, glassy, and modern. Domestic and international flights depart from the same terminal. As is common in Turkey, you must scan your luggage and pass a metal detector upon entry to the airport (and that’s before you even get to proper airside security). Terrorism is a real threat in Turkey and the authorities are taking no chances. At the other end of the terminal, to the north, is passport control and security. It’s not wise to photograph or even appear to photograph any security checkpoint anywhere, so many of my shots of the check in hall are oriented east-west! 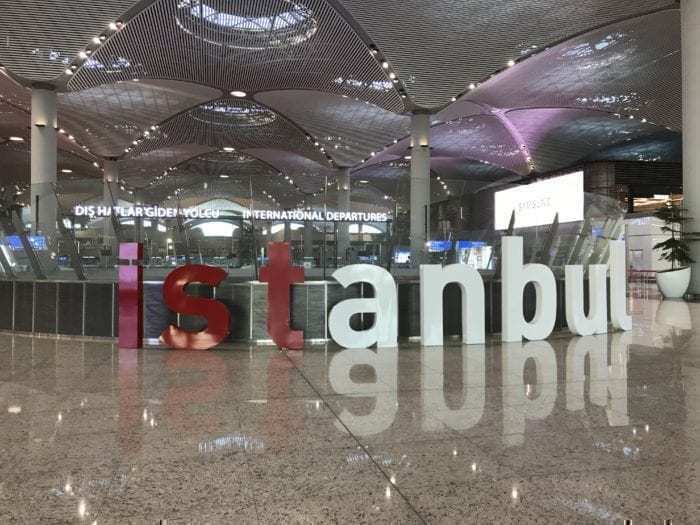 Istanbul Airport welcome sign – a new Instagram landmark? The main impression I got from the terminal was how utilitarian and characterless much of the architecture was. This isn’t a complaint, but rather an observation – utilitarianism has its own beauty. Nonetheless, there’s nothing particularly Turkish about the airport. Teleport a stranger there and ask them where they are, and they might think they were in Germany or the USA. Perhaps this is Turkey’s calling card – “we’re modern, forward looking, here to stay and we aren’t what you thought we were”. I note also the new airport is unlikely to be named after Ataturk, even after IST closes. Food for thought. There was a lot of construction work evident; this airport is not even close to being finished. With just four flights leaving that evening, I strode around the empty husk of an airport with an eerie feeling. Airports aren’t airports until they’re bustling with people heading to hundreds of destinations. Airside, there’s a huge duty free area. Nearly all the shops were closed – and no restaurants were open yet. There’s just a handful of cafes open at present and a couple of shops. However, almost all of the retail units appear to have tenants with branding ready to go, which is a positive sign. There’s plenty of space in the duty free area and it was a pleasant place to be – and I think it’ll stay that way after the airport fully opens. 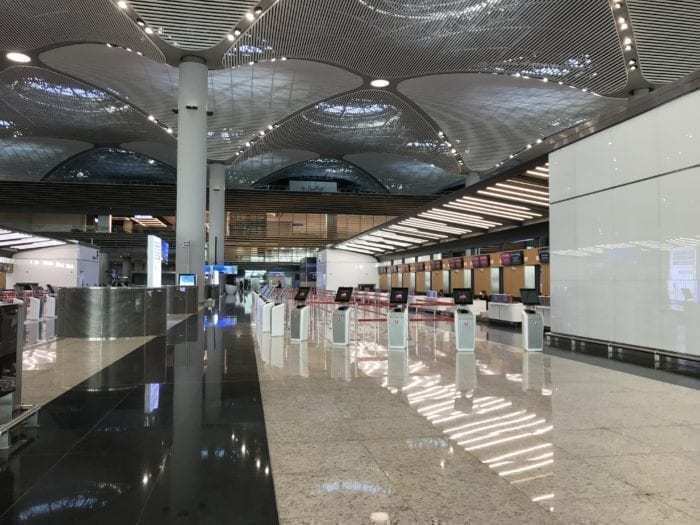 No airport lounges were open when I visited, but Emirates, Turkish and IGA (airport operated) lounges were signposted and I expect them to open once the airport is fully operational. There’s also a mezzanine level to the duty free area, which appeared to contain a quiet “snooze” lounge open to all passengers, but this wasn’t open; in fact, the whole mezzanine looked completely unfinished. My flight was departing – 90 minutes late (!) – from the F gates, and I took a walk around them to drink in the strange atmosphere. The sheer size of the airport was evident as it took a good 15 minutes to walk from one end to the other of the F gates alone. Turkey’s controversial president, Erdogan, looks down on passengers as they circulate between gates. Wifi is free, but relies on SMS message to activate. It didn’t work for my UK number – I never got a code. Your experience may vary! All gates that I saw were bridged (not sure if there are bus gates not yet operational), and every seating area had charge sockets for European and USB hardware. 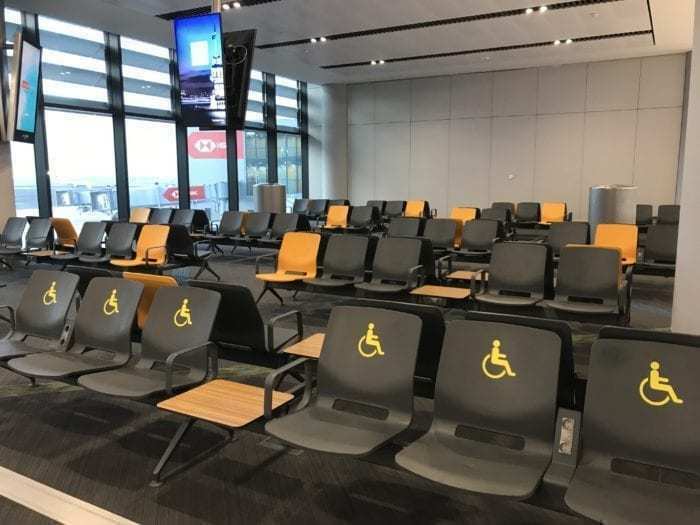 There are also mini-lounges which were not operational, containing Star Alliance Gold signage – I assume these will be more like dedicated waiting areas rather than full service lounges, but they’re a good idea. Short connections within dedicated gate areas become more palatable if you know you’ll have time to grab a coffee or snack, rather than trekking 15 minutes each way to the main lounge. In the bowels of the F gates are a mosque, with male and female ritual washing facilities (I did not enter the mosque nor did I take any photos, but I could see the facilities through the open door), and a multi-faith prayer room. I hope they get a few chairs or prayer mats for this room – it’s the emptiest in the airport by a distance and that’s saying something! 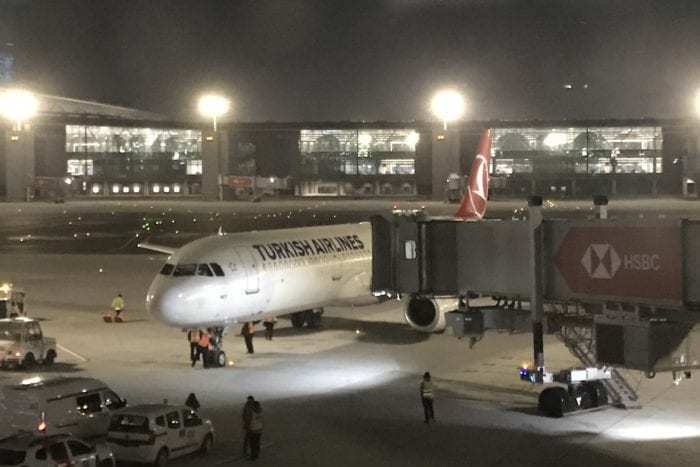 My flight to Baku was boarded promptly and efficiently by smiling Turkish staff, and we were soon under way, rocketing over the Black Sea on our way to Azerbaijan. I was left to reflect on my experience. All airport stands were empty! Overall, I think this superhub and the new business class products being rolled out on Turkish Airlines this year represent a step change for the country and its aviation sector. I am already looking forward to returning once the airport is fully open to see what it’s like when all cylinders are firing (let’s hope the metro connection is built soon, though!). Watch Turkey and Turkish Airlines closely over the next five years. I will be. 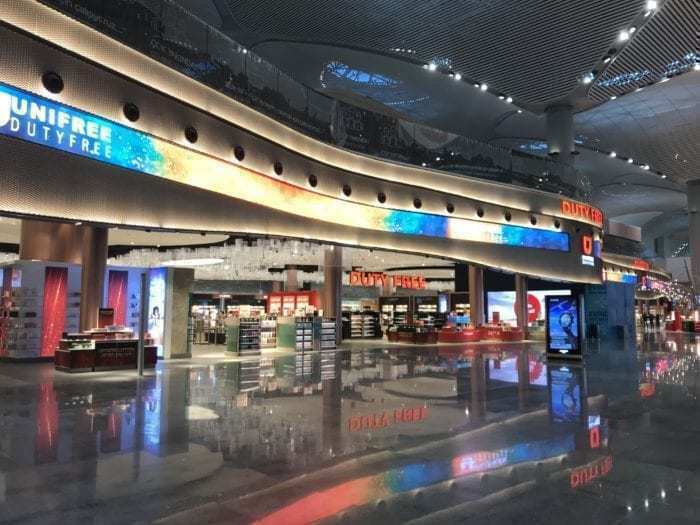 Istanbul New Airport opens as a Turkish Airlines hub on March 3, 2019, and to other airlines much later over the next few years. Check before you travel. Hi Paul, Great videos! Thank you. Can you place the exact date you’re taping on your videos. YouTube can be off by a month or so. Exact dates help orient yourself as viewer. He had shot this video on the 2nd of February, you could see the date if you stop the video while his boarding pass is being printed. By the way, Paul, if you had chose to check-in at one of the desks instead of a kiosk, they would told you that they are accepting international passengers to the domestic lounge. You should use the domestic security to access the lounge. Then they would either bus you to the international departures area for immigration or they would ask you to walk back. Thanks Janet – the month of recording is always in the description text of every video, but you need to watch in YouTube to read that. I flew on February 2nd. The Turkish Airlines lounge should in theory be open for early March, when the airport becomes a Turkish hub. Fingers crossed! Looks like the full opening will be delayed until after the March 31 elections there. If my travel stars are in alignment, I’m hoping my flight from Athens to IST, 4/12, will land in Atatuck for a quick trip to my hotel in old town. THEN, I hope to fly back to USA from the new airport, 4/17, to wander about the new place. Fingers crossed is right! Well, when you hire a Norwegian architect firm to do the master plan utilitarian is probably what you end up with. Same company that did Oslo airport back in the 90’s. I have no idea why you would have two airports named Ataturk. Not really food for any thought unless you really want it to be. Should the new Denver airport also have been named Stapleton? Fast walking, it took a little under 45 minutes (using all the moving walkways). There is no transfer train or bus. My arriving flight was 30 minutes late, and with the 45 minute walk, of course I missed my flight and was exhausted. The airport are advising minimum 3 hour connection time for international to domestic transfers, and though i thought this was a wild exaggeration , I now understand why. I conclude this airport is not suitable for international to domestic transfers, and will be using Sabiha Gokcen whenever possible in future. Architecture is designed to impress with little thought for practicality. Distance from down town with no train/metro access and very limited airport hotels also very negative.